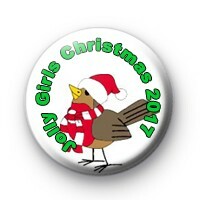 Custom Jolly Girls Xmas badges for Roy Wheeldon featuring a festive Christmas robin and the text Jolly Girls Christmas 2017 around the edge. Standard 25mm badge handmade in our UK workshop. If you need custom Christmas badges, get in touch with your requirements.